I’m very pleased to be kicking off the 2017 season of Gallery An Talla Dearg, with a three week solo exhibition over the Easter holiday. 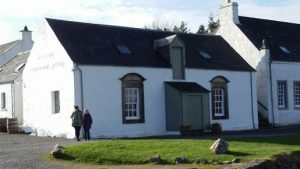 It is a great wee gallery, in a lovely location beside Hotel Eilean Iarmain at Isle Ornsay, south Skye, with gorgeous views over the Sound of Sleat and distant Knoydart. I will be there throughout the exhibition and, as usual, I’m always happy to answer any questions about my work and carving techniques. Unfortunately, I won’t be able to actually carve there (it’s much too messy a process), but I may be able to do some polishing, and will certainly be able to work up some ideas for future sculptures. Should you be interested in commissioning a sculpture for your home or garden, it is an ideal opportunity to take a closer look at my work and talk to the artist in person. The exhibition runs from 7th April to 25th April.